Kelvinside Hillhead is the Church of Scotland parish church for the Hillhead, Kelvinside and Kirklee areas. We are committed to loving and serving this community to which we belong. ​We are a friendly, diverse and inclusive community, always keen to welcome new people. This is a place where generations meet. In worship we are nourished and challenged by lively preaching, with thoughtful liturgy and quality music both old and new. ​Join us on any Sunday in this beautiful, sacred space. ​Come as you are. All are welcome. ​We have regular activities and events for all ages, particularly for students and for families. There is also a lively arts ministry, with regular concerts and lots of opportunities for singers and instrumentalists. Anyone in the parish is welcome to contact us about baptisms, weddings or funerals, or for pastoral care. You can find out more by contacting the relevant person here, or by visiting our facebook page for up-to-date events. West End Weans are meeting downstairs in the hall as usual on both school holiday Fridays (5th and 12th April) but will not meet on Good Friday (19 April). On Sunday 24 March this year we set time as a congregation to Celebrate church: in Worship we saw that many people had known different churches the length and breadth of Scotland and as far flung as Malawi and visitors from Australia. In a sense this could have been any Sunday, as barely a Sunday goes by, but we welcome visitors from around the world. Sometimes too we welcome visitors and the good thing is that they are able to stay. All of this is happening to and for us in Kelvinside Hillhead and there is no reason why this should stop. As part of our Celebrating Church we took time out from our coffee and hot cross buns, to write down what is good about our Church. People recalled significant life events in a congregation of young and old alike and across the generations. And so one lady recalled the memory of her youngest being baptised 52 years ago. Others said they enjoyed the baptisms of older children and adults. All this is captured in a sanctuary that enlightens our spirits with colour and detail and the illuminating light shining through the stained glass. Young and old described it as a place of calm and tranquility. A place where people’s souls were fed spiritual fruits. Underpinning all this was the social friendships that we enjoy with one another. Delight at home baking and the opportunity to drink cups of coffee. Examples of people’s skills at making jam and chutney and knitting church mice and more. But ours is not a church that looks inward- we are here for our community and that may be you. So please do visit – and even come to stay! 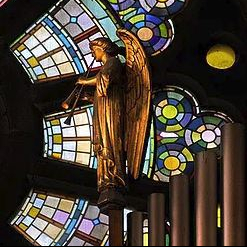 Kelvinside Hillhead Parish Church is a large traditional church building with a quiet ambiance. The spacious, light and quiet sanctuary generates a deep feeling of peace in people who are suffering the loss of a loved one. In the event of a death in the family, you should first contact an undertaker to make arrangements for the funeral. If you wish to use the Church, you should tell the undertaker – who will then contact the Minister. The detailed arrangements are then made between the undertaker and Minister. You do not have to be a Church member to use the Church. We will organise an organist and ensure that the Church is ready for the undertaker, family and mourners. For specific enquiries and advice on funeral arrangements, please contact the Minister, Rev Marian Cowie, using the form below. You can be married in our Church even if you are not members of the Church of Scotland or Kelvinside Hillhead Parish Church. If neither the bride nor groom is a member of the Church, the first approach should be to the Minister for advice. preferences – including a ceremony in a public or private building, e.g. a hotel. Contact the Minister, Rev Marian Cowie, using the form below. It’s Shrove Tuesday so time to make pancakes! At Messy Mardi Gras on Saturday morning we made and ate these pancakes – they are the drop scone type that are lovely with butter and jam, or stacked up and eaten with blueberries and syrup! Makes about 12 small pancakes. Note: if you make these in a large jug or a bowl with a lip, it’s much easier to pour the mixture into the pan than to use a spoon. Mix the dry ingredients and make a well in the middle. Break the eggs into a measuring jug and add milk to make up to 300ml. Then add the milk & egg into the dry ingredients, a little at a time at first, so that you get a smooth batter. You’re aiming for a similar thickness to double cream, so add less or more milk as required. Heat a little oil or butter in a thick bottomed frying pan and pour in the batter to either make several small pancakes or one large one at a time. The pancakes are ready for turning over when the tops are bubbling and the edges have started to set. The second side will take less time to cook – less than a minute in a hot pan. Roger Sturrock will be leading this year’s Lent Bible studies based on the film “The Greatest Showman”, the story of the great American showman Phineas Barnum. The study booklet is entitled “From Now On” and deals with the great themes of hope and redemption. The studies will begin with a showing of the film at 7.30pm in Wellington’s Woodlands Hall on Thursday 7th March followed by 5 studies in the Hall from 7.30-9.00 pm on Thursdays, 14th, 21st, 28th March and 4th, 11th April. Coffee and tea, etc., will be available. Please make a note of these studies in your diaries and come along. Everyone is invited.